Having only a handful of broccoli plants to grow, it’s doesn’t bother us to have few cabbageworms eating the leaves of our plants. It’s the buds not the leaves that interest us. To keep the damage on the leaves under control, we play what we call Cabbageworm Armageddon. But, when it’s time to grow kale, we want to eat the leaves. The zone becomes “no-open buffet” for cabbageworms. To keep the kale under protection, we can use- which I did in the past- a lightweight floating row cover with hoops to avoid the kale from being crushed when the fabric is wet. It really works but the fabric rips easily, and has a life expectancy of only about 20 weeks. Take note, too: to water your plants correctly you must use the technique as my wife, Donna, shows on the picture below. This year, I am trying something different: fiberglass window screen. Unlike the lightweight floating row cover, it is not frost protective. Air, light, and water can penetrate the material, with the added bonus: it appears to keep the rabbits away. The fiberglass window screen is easily available from the hardware store with a width of 36”, 48” and 60”. On the negative side, the material is slightly more expensive than a lightweight row cover, but should last for years. Also, being heavier, you must use a support such as a 14 gauge wire hoop to support the fiberglass screen. 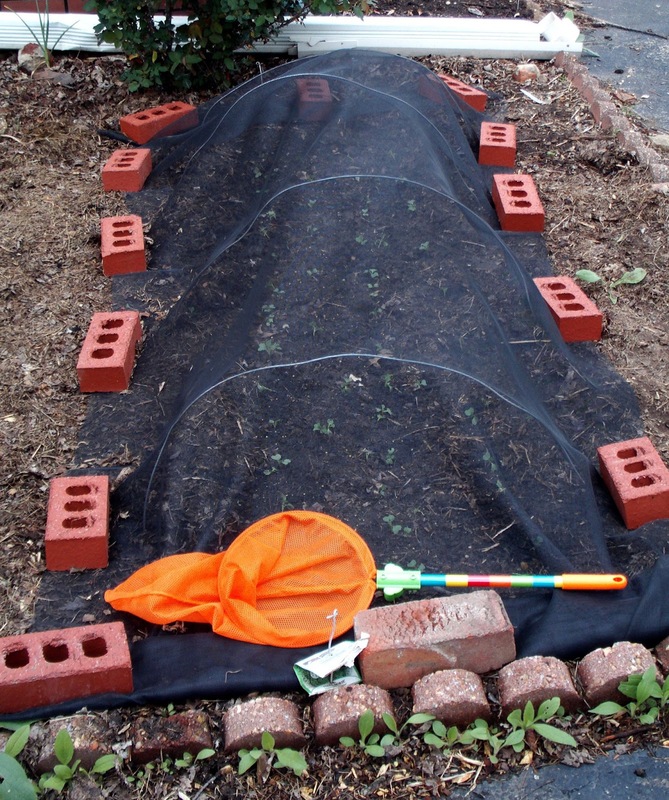 From experience, covering your Brassicaceae family member – cabbage, broccoli, kale, radish, turnip, collard greens , bittercress – with a fabric barrier will not discourage the imported cabbage moth to lay her eggs. 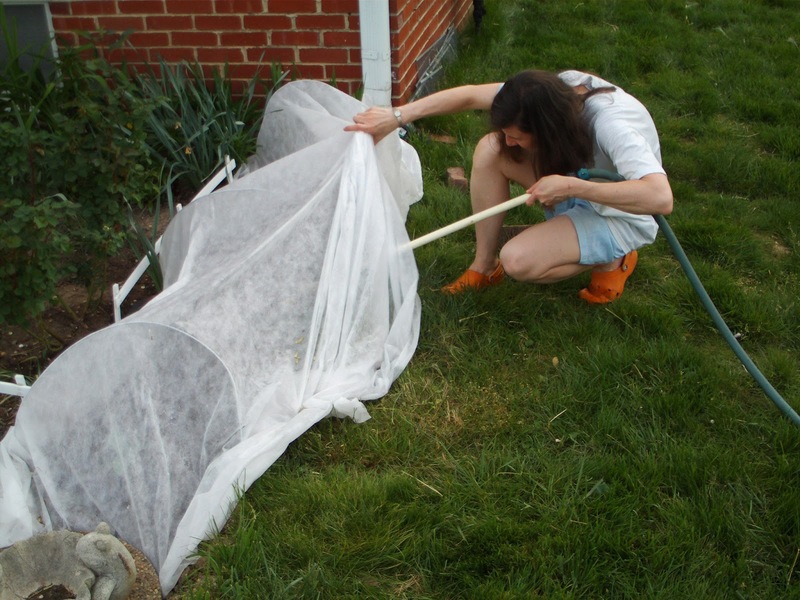 She will do it on the fabric near the junction with the soil or she will try to find another host such as stevia or an apple tree as a desperate measure. This is why I use a butterfly net: to eliminate the middleman. i also have the worms this year, on some red cabbages that i overwintered. i have my younger cole crops under row cover but not these. i tried spraying them with diluted Bt, but the leaves are so water-repellant that the spray just sheds off. i usually use a drop of dish soap as a surfactant but i think this is live bacteria–do you know what i can use to help? thanks for your blog! Adding a TBS of soap will not harm the Bt and may aid in control of the cabbageworms if you hit them directly with the spray. Good luck. thanks for your rapid response, Jon! I will give it a shot.